Google AdWords super charged the search advertising platform in three exciting new ways announced last week. For our SEM management clients, we wanted to share the new ad formats, automation tools and measurement capabilities we on the Bruce Clay, Inc. SEM team will be putting to work on your campaigns in the coming months. By the way, if you’re considering how your business can benefit from leveraging the enhanced tools and reports described here, we’d love to talk to you about how we can help your business with search engine marketing services. That was the rallying cry of Jerry Dischler, Vice President, Product Management, AdWords, during last week’s AdWords Performance Summit. (See the full livestreamed event here.) The micro-moments concept seems to capture the way that we can look up, drive to and purchase anything we want at any moment thanks to the many Internet connected devices in our lives. This ever-connected, multi-device behavior was the catalyst for the coming changes to AdWords that advertisers can expect to see rolled out in the coming weeks. Did you know, more Google searches take place on mobile devices than on desktops in 10 countries, including the U.S. and Canada? Google’s Dischler explained that “91 percent of people use their mobile phones to search for things in the middle of some other task.” So, what can advertisers do to make their search ads really stand out? Enter new engaging, flashy and functional formats for mobile ads. On a mobile search results page, the new mobile ads present a carousel of product images along with informative details. Potential customers get more information for making purchasing decisions. AdWords introduced the new ad formats that will be rolling out this year in four specific industries: shopping, hotels, autos, and finance. Our clients in these verticals can look forward to having these new mobile formats implemented, and the good news for everyone else is that more verticals will be released in time. Autos: Through a new mobile ad format, searchers will see a carousel of images of cars for sale, with photos of the interior and exterior of the auto searched. Images are accompanied by a direct link to sites, available offers, and dealers. A ton of the hassle and hard work of buying a car is alleviated with these new mobile ads for autos. Hotels: New mobile ad formats offer hotel information, location, reviews, and hotel images, and searchers can even book their room directly from a mobile SERP on the hotel or travel site of their choosing by simply clicking BOOK! Traveling and planning a trip can be difficult, but this new ad format makes all the tasks of travel, from comparing prices and researching possible destinations, easier — even from a smartphone. Finance: Google Compare comparison ads really shine in the financial space, where a consumer can be overwhelmed by options. Finance related mobile searches, like searches related to mortgages and credit cards, rose 48 percent year-over-year in Google. Now mobile searcher can compare mortgage offers and credit card offers in a functional new ad format. 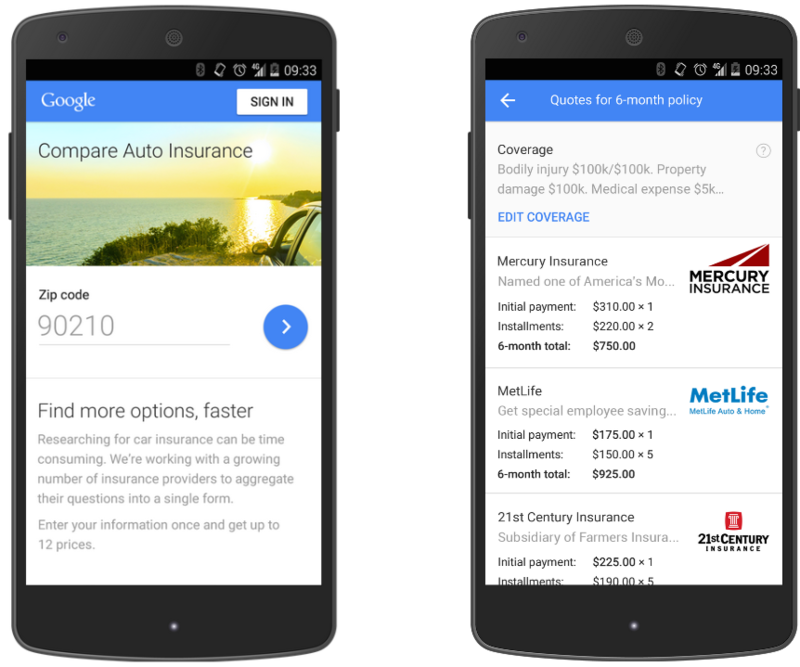 Seen here, Google Compare for Auto Insurance was released in March of this year. Now searchers will be able to compare credit cards and mortgages from a Google mobile search. Mortgages: Google is now offering options to assist mobile searchers looking to take a big next step and major financial decision: buying a home! Mortgage comparison is soon coming to Google Compare, bringing comparable rates and agent support for the mobile mortgage researcher. With Google Compare for mortgages, first-time buyers or home buyers in general will be able to compare mortgage rates from multiple providers, from interest rate to term of loans and fees. Comparisons can be made by applying a customized set of criteria. Best part? Mobile users can apply and speak to a lender directly from that specific Google search ad. Credit Cards: What about the mobile searcher looking for the right credit card? There are so many cards to choose from, with different rates and rewards to consider. The selection process is much less painful now that Google Compare includes credit card comparison in search results. From these mobile ads, searchers can compare rates and available informative information, and apply for the card right from the ad. Shopping (local): Changes to the mobile shopping experience were announced in the form of improvements to local inventory ads. Local inventory ads let people searching for a desired product see if and where that product is available, before even stepping into a store. The enhancement announced last week is an expandable product card, where more details about the product are available when a viewer taps through. What was staggering to learn was that in the “first 5 months of this year, shopping searches saw a growth of 175%.” With the changes to local inventory ads, it won’t be surprising to see shopping search traffic increase even more for the remainder of this year. Google is surely on the right path of assisting both customer and advertiser in completing that purchase! Did you know that nine out of 10 smartphone users start a task on one device and finish on another? Of all these new options, the last one is important to call out as a brand new attribution model. Data-driven attribution uses machine learning and analysis to assign value to particular parts (keywords) of the customers journey path, reported as a percent contributor to the final conversion. In other words, it calculates the contribution for each of the keywords that take part in the customers’ journey. 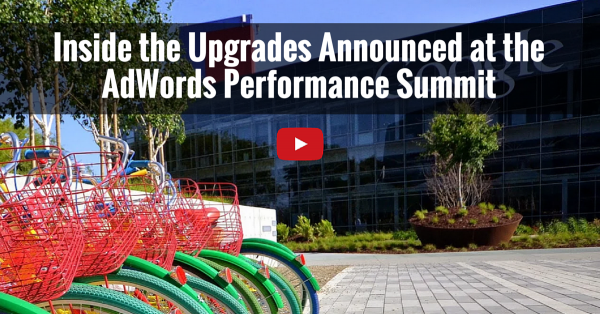 These advanced attribution models will be reflected in AdWords reporting, and eventually will be integrated into automated bidding, another announcement from the AdWords Performance Summit that’s explained in point No. 3 below. Another way advertisers are getting more control by better being able to see the path of the customer journey is through newly announced cross-device conversion tracking. To be rolled out later this year, advertisers will be given insights into cross-device conversions, which will also be integrated into automated bidding. Did you know that 15% of searches on Google are unique and have never been searched before? Addressing this, AdWords announced upgrades to an existing AdWords feature: Dynamic Serving Ads. The beauty of Dynamic Search Ads is that they automatically generate search ads that are relevant to a search by creating ads “based on the content of your website.” DSA campaigns can be set up “without the need to manage keywords.” DSAs were already pretty easy to set up within AdWords, and soon they’re going to be much easier and contextually helpful! To be rolled out in the next few months, the Dynamic Search Ads dashboard promises to be easier to use. The upgrades lead to less setup time, more info about the dynamic ads that have been served and more targeting and suggestion options. Secondly, Google introduced a new addition to Automated Bidding family: simulation tools and a reporting dashboard focused on identifying and optimizing bid strategy opportunities. The bidding simulation tools provide insight into the differences between volume and costs at different CPA targets. The reporting dashboard is going to offer more transparency and tools for better campaign management. We can’t wait to get our hands on these in the next few months. New ad types that dazzle on mobile. If you’re in auto, finance, shopping, hotels or brick-and-mortar retail, you have got to upgrade your ads to the visual and interactive new mobile ads. Data-driven attribution models across devices. You’ll be able to credit keywords and ads along the conversion path, beyond the last-click, tracking the multi-touch, cross-device customer journey. Automated bidding solutions that calculate volume and bids for your target CPA, and upgrades to Dynamic Serving Ads that make them easier to implement. It’s not surprising to see that mobile is a big area of focus for Google, and we in the advertising community are the beneficiaries. These new tools help us understand what our advertising is doing to reach our customers living, working and getting acquainted with our businesses online. We expect the changes announced last week are just the beginning of enhancements to go give advertisers more information and more options for reaching searchers. It benefits Google, after all, to get more ad dollars from happy advertisers. 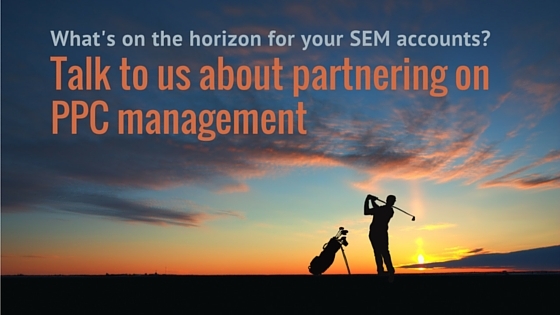 If you’re a BCI SEM management client, we look forward to talking with you in the coming weeks about our plans and recommendations to make the most of these new opportunities. f you’re looking to maximize your AdWords account management with these new features, request a free, no obligation quote and let’s talk soon. Thats Great news, I am planning to advertise my site on mobile for approching mobile users, In India, my 50% of total adsense earnings comes from smartphone user. Mobile have great future market. Thanks for this great post !! well cross device conversion tracking estimated on mobile devices. but issue like “Tablet to Computer” are prohibited in AdWords. so how much time to rolled out ? @Citra – so happy to hear that you found this article helpful. Please let me know if you have any questions. @Khan Pnr – thank you for your post! Good luck with your SEM campaigns. Many great thanks to you for your information here, now I can make my first mobile ads peacefully. I learn that we will receive many new things that will make advantages to our business here. Thanks again for your informative and useful article here, Diana. Also they have started Gambling ads in less amount! I think they adapted new changed as Mobile users are growing!